One thing we can agree on is that a streamlined iPhone address book will allow you to find the contacts you need quite easily. Over time, your iPhone address book will become cluttered. When you check what is cluttering your address book you will note that you have contacts you don’t need anymore. These are contacts you can remove from your iPhone. Deleting contacts from an iPhone is not an easy task. This is because iPhone does not allow its users to delete their contacts in bulk. To delete a contact, you have to open it, click Edit, and then scroll to the bottom of the edit page so that you can click Delete Contact. This means that if you are deleting a large number of contacts, it will be time-consuming. To help you out, we will be showing you how to delete all contacts on iPhone if that is what you wish to do. 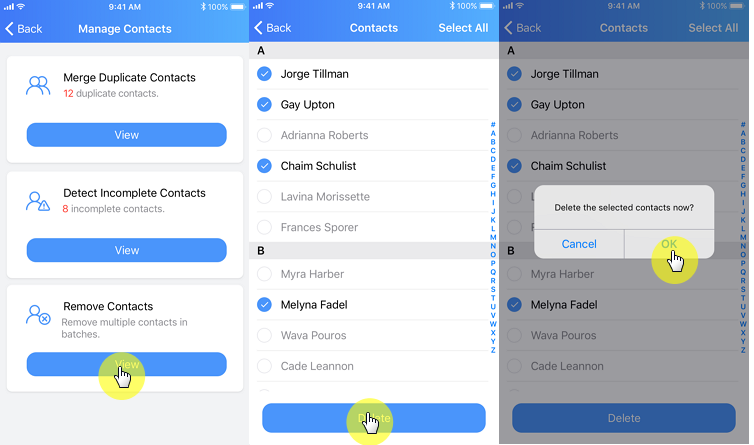 If you just want to delete multiple contacts on iPhone and not all of them, we will show you how to select these contacts and delete them all at once. Step #1: On a computer’s web browser, open iCloud.com. Step #2: Using your Apple ID and Password, log into iCloud. Make sure that the iCloud account you log into is the same account that syncs your iPhone. Step #3: Tap the Contacts icon. Step #4: For Mac users, you will need to hold down the command button. For Windows PC users, you will need to hold down the Control button (Ctrl). While holding down either the Command or the Control button depending on the computer you are using, click on each contact you would like to delete. This makes it possible for you to select more than one contact. Step #5: You can either click the Delete button available on your keyboard or you can click the small gear icon located at the bottom-left corner of the page and then select Delete on the menu that appears. Step #6: Confirm that you wish to delete the selected contacts on the dialog box that shows. As long as syncing with iCloud is enabled on your iPhone, the changes should be reflected on your device. Mac has a Contacts application that can be used to delete multiple contacts on iPhone. For this method to work, you have to be signed into the same iCloud account on your iPhone and your Mac. You should also make sure that Contacts is on in both your Mac and iPhone. Step #1: Open the Mac System Preferences and then choose iCloud. Step #2: Use the same Apple ID and Password that you used to sign into iCloud on your iPhone to sign into iCloud on your mac. 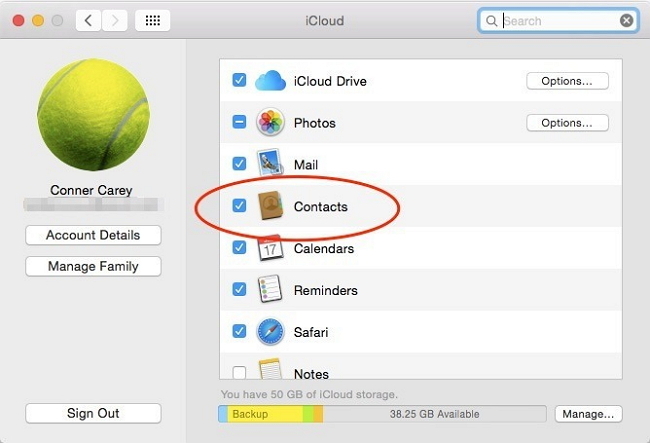 Check contacts to ensure that the contacts on the Mac and your iPhone can sync. Step #1: On your Mac, locate Contacts app and open it. Contacts app is available in Applications. Step #2: Hold the command button down on your keyboard. Next, click the contacts you don’t need anymore. Step #3: After selecting the contacts, release the command button and then right click on the selected contacts. Step #4: Click Delete Cards and then click the Confirm Delete button to remove the unwanted contacts from your contact list. Since your iPhone and Mac Contacts apps are syncing, the changes you make in the Contacts app should be reflected on your iPhone. How to Delete All or Individual iPhone Contacts Using Free iOS App? As you can you see, all the above methods describing how to delete all contacts on iPhone usually involve too much work. But, luckily for all iPhone users, there is a free iOS application you can install on your device and use it to delete the contacts you don't need quite easily. The application we are talking about here is known as iMyFone -- Manage Contacts & Data. You get to back up all your contacts without wasting much of your time. You will have the ability to transfer all your contacts to a new iPhone in bulk instead of wasting your time while adding them one by one. The app allows you to remove (bulk-delete) any undesired contacts present in your iPhone. You get to find all the duplicate and incomplete contacts. You can preview and merge all your duplicate contacts using iMyFone iOS app. Step #1: Install and launch the iMyFone iOS app on your iPhone. Step #2: Tap on Manage Contacts and then click OK on the dialog box that shows up to allow iMyFone to access your contacts. Step #3: Tap View under Remove Contacts. 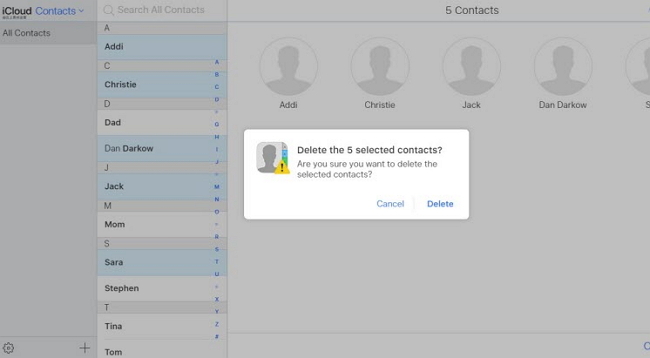 Step #4: Select the contacts you wish to delete. If you wish to delete all the contacts, tap on Select All at the top-right corner of the app screen. Step #5: Tap the Delete button at the bottom of the page and then tap Ok on the dialog box that appears. Step #6: Wait for iMyFone to finish deleting the contacts. You should see a Deletion completed notification when the app finishes deleting the selected contacts. Deleting contacts in bulk on your iPhone is not possible. This is because iPhone does not have the option. The options that you have include using iCloud, Mac’s Contact app or iMyFone iOS app to delete multiple contacts on iPhone. The first two options involve a lot of work. Therefore, iMyFone iOS app is the best option that you can use to delete multiple contacts on iPhone. iMyFone is 100% free.